The Whispering Tyrant is free! The time to strike against him is now, before he recovers his full might and his long-dormant armies. Arazni, fallen demigoddess and queen of the dead lands of Geb, presents the heroes with a daring plan. The heroes must enter the dangerous land of Virlych, pass the bizarre profusion of alien plants and mutated wildlife around the Whispering Tyrant's former prison, and disable his arcane protections so that Arazni and the heroes can face the lich in battle. Yet Arazni's undead bodyguard-jailors seek to drag her back to Geb, and the remaining knights of Lastwall perceive both liches as their enemies. The heroes must navigate threats from both the living and the dead to stop the Whispering Tyrant from extending his grasp even further! 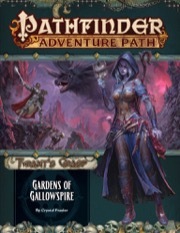 "Gardens of Gallowspire," a Pathfinder RPG adventure for 11th-level characters, by Crystal Frasier. An examination of the staggering fecundity and variety of carnivorous plants, by Andrew Mullen. A series of short missions wherein the PCs confront the Whispering Way's insidious and pervasive attacks on the nation of Lastwall, by Ron Lundeen. An article on the Whispering Tyrant's witchgates, powerful magic wards that redirect teleportation and harbor powerful and rare guardians, by Christopher Wasko. A bestiary of fearsome monsters, including a magically animated armory, a daemon that preys upon worry, a cold-weather plant with a taste for blood, a dazzlingly magical but deadly beast, and a gnome wrenched away from the Bleaching into undeath, by Crystal Frasier, Andrew Mullen, Emily Parks, and Rhett Skubis. Announced for May! Product image and description are not final and are subject to change. Hmm, so this is more of Lastwall focused AP then? I was hoping for another Ustalav one, maybe with a focus on the politics and the corruptive and stagnant elements of the church of Pharasma as presented in Reign of Fear. Really not a fan of Paladins, oh well. I'll probably pick it up anyway and give it a read at least. If the description is accurate and this chapter is for 11th level characters, this AP will be going to level 20 like the previous one does. It also makes sense if the big bad really is Lich #1. Afraid the Paizo people have already confirmed this has traditional level progression and doesn't go to level 20. A level 11 adventure for book 4 fits with this IIRC. It would be good if 1-20 became the standard and I'm sure they have said this will be the aim with PF2 APs. There's a Whispering Someone-or-other who also isn't a fan of paladins. At all. Nope, not quite to level 20. As we learned with Return of the Runelords, that requires quite a heavy page commitment, and we've got lots to say by way of support articles for this AP. It's our last chance to get some first edition support in, and I'm making sure we take it! Will this adventure Path tie into Carrion Crown and/or the goings on in Strange Aeons? The events of Carrion Crown are assumed to be in the past for the purpose of this AP. The main villainous organization in that AP shows up a lot here, in some exciting and ominous ways. However, there isn't a lot of specific overlap with Strange Aeons. Curiously, does any current AP or module overlap with this and Carrion Crown? Ya know, I'm kinda hoping now that the "additional bonus adventures in last wall" gets changed to something else when the final summary has come out ._. I mean, bonus adventures have always been cool in APs, but they haven't always been easy to integrate in the AP itself and since this is final AP for 1e, it kinda feels like I'd rather have more articles on 1e stuff as much as possible. Yay, product info update! Nice cover with Seelah vs. Massive Bat. Y'all, there are a ton of weird, cool carnivorous plants. * Without going into specifics, a few of the lower-level missions can fit into the adventure path more easily during the PCs' travels. Your players then consider those part of the adventure path experience. * You can use the higher level missions by modifying them down or up in difficulty to insert them when you feel appropriate. They needn't be locked into the level at which they're presented. * You might talk with your players about building new characters as a single-session break. This lets players try new character classes and options they might never otherwise consider. Some of your players might even like their new characters and want to switch over for the main campaign (or keep the new character as a back-up in case some unfortunate end meets their main character). This also works well if your characters are still low-level and you have them build a much higher-level character for a single-session game; it gives them a preview of what higher-level play is like. * You can take a break from GMing to play, having one of your players run one of these adventures instead. They don't spoil the plots of the individual Tyrant's Grasp adventures. 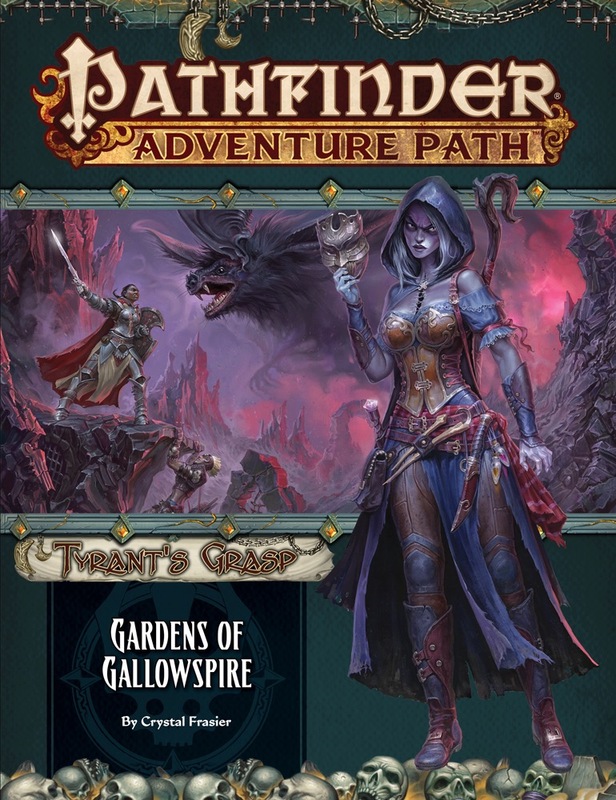 * With some work, you could flesh out all the mini-adventures presented here to create a short campaign of its own, running it before, after, or alongside your Tyrant's Grasp campaign. This mini-campaign would run from about 9th to 13th level. * You can try a "killer mode" style of play where your players build characters a few levels lower than the mini-adventure is designed for. It becomes a test for them to see how long they can last in an adventure with challenges that can overwhelm them. If these characters dies, it doesn't impact their primary PCs (but it does lean into the "survival horror" theme of the adventure path. Precisely because this is the last First Edition adventure path, we wanted to ensure that as much material about Lastwall and the adventures in it are presented here. Enjoy! Also I LOVE the bestiary articles plus more on my favorite thing from Carrion Crown; WITCHGATES!!! Is that Arazni? Man...I really love how she’s drawn and this part of the adventure sounds the most dynamic, having to fight a cult and possibly a holy order all at the same time. Give me that True Nuetral pathing baby! Isn't there always a cult though? Pathfinders always dealing with the cults of Golarion. I'm kinda surprised there is article on plant monsters ._. I think you'll be surprised how fitting an article it is, and not just for this particular adventure.